Generate MASSIVE Paydays From Flipping Brand New Websites! The Missing Link Between You And Online Riches Is One Click Away... Find Out How I Stumbled Upon A Little-Known Formula To Multiply Your Online Profits Almost Instantly Just By Flipping Virtual Real Estate! 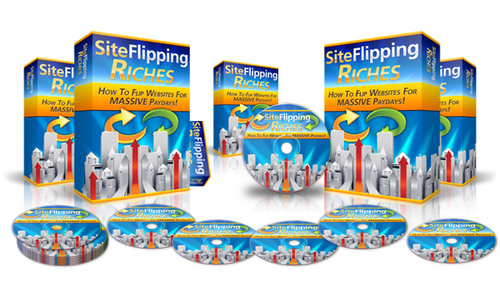 Site Flipping for Massive Profits Made Easy! - completely Newbie Proof! Swipe my personal strategies to cash in on big paydays by flipping any website I have at my disposal, for 10-12 times the price of my monthly income from these sites! You don't necessarily need to have websites right now to start using this guide. I will also teach you how to build sites from scratch, in the fastest time possible, and flip these new sites for big profits. Site Flipping Riches is broken down into 5 easy-to-follow videos, teaching you how to build and sell websites and see big paydays! The first module reveals the necessary ground work you need to do for every website so you can make them 'flippable'. Know your exit strategy before you even go on to construct your first website. If the website cannot be automated, is attached to strongly to you as an individual or dependent on the owner, the website CANNOT be sold. This is a classic mistake website builders make and the first step is to avoid that first! The fastest way to have a website for sale is to buy one. But if you want to make a profit from it you must know how to buy low before you can sell high. I reveal how I do this 'unfair' exchange with my share of advantageous tactics to reap high profit margins... allowing you to flip websites on a massive scale! Just starting out? Running on a tight budget? No worries! I show you how to create websites from scratch using little cost that is next-to-nothing. This is NOT your "How to build a klutzy website 101" guide. I always talk about the exit strategy, which is to ultimately sell your business (in this case websites). This is how all your websites will be architect from now on - programmed to be sellable and to be sold for big paydays! Website buyers look for a few key criteria and requirements before they decide if the website is worth buying over. And how would you know? The answers are in this module. Learn how to add massive value to your website or list of websites, and do it all with a small ounce of effort, time and cost on your part! This is it! Discover the goldmines on the Internet and some of the best marketplaces where all your buyers are gathering, eager to buy websites with cash ready at hand! Follow this entire course sequentially and you will soon be enjoying big paydays from every website you sell and auction off! "5 Days money back guarantee"
This purchase is risk free! I offer a 5 days money back guarantee!